We have changed our Android app project to use gradle, but have noticed it is building significantly slower. I don't have any ideas about getting more details information about thies tasks. Is this normal? How could this be improved? I know the new build system is still in betas, but it seems like others are building much faster. AndroidStudio 2.0 Will probably help you out to improve the build process. AS 2.0 Actually includes the app restart option to improve the deployment. If you have modules in your project. 2.0 will do pre-dexing it and keep it to build. Until we have any changes in the module, it does not require to re-dex and it dex'es only the modify piece to run on the device/emulator. Seriously, that saves lot of time. Do module based business. Progaurd optimization and obfuscation tasks also plays a role in slowing down the building process. Do the following to stop optimizing and obfuscating with progaurd while you wants only debug mode. After at all AS 2.0 with the default settings itself help you to improve the building performance. One more tips every developer would suggest commonly is make the Gradle plugin offline mode enabled if you do not added any new library dependencies for particular build process. Not the answer you're looking for? 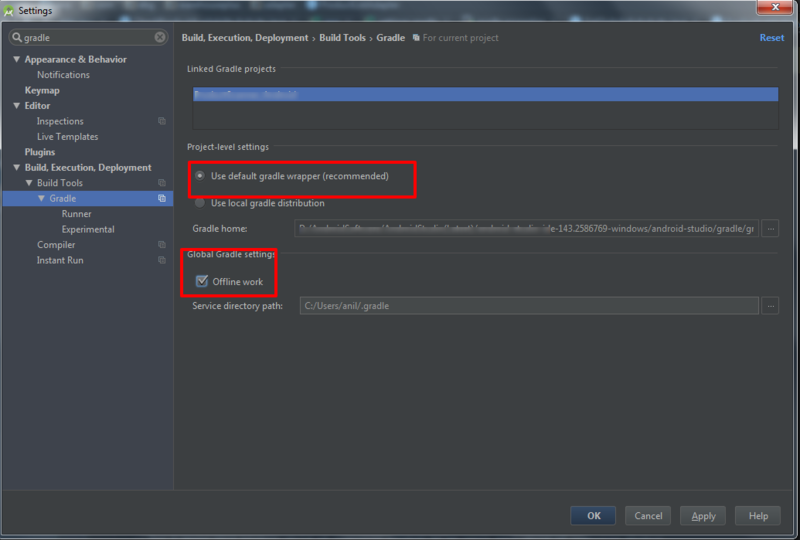 Browse other questions tagged android android-studio intellij-idea gradle or ask your own question.